Video game retailer GameStop Corp (GME) is expected to post third-quarter earnings after trading closes on Thursday, Nov. 29. The market expects earnings of $0.56 per share on revenue of $2.04 billion. On Monday, Nov 26, GameStop jumped 9% in early morning trade on Cyber Monday hopes, backed by an analyst upgrade from Bank of America Merrill Lynch. Bank of America Merrill Lynch lifted the stock to NEUTRAL from UNDERPERFORM as it banked on the retailer’s ability to do good on Cyber Monday. “Even with free cash flow dwindling to under $100 million by 2020, for now there is ample cash for capital return and we see less risk to the dividend which yields 11%,” read the analyst report. With Sony (SNE) PlayStation and Microsoft (MSFT) Xbox console platforms, along with PC gaming shifting to digital downloading and eSports, physical games have taken a hit. And this is the core business of GameStop. Shares have tumbled more than 70% in the past five years, and the retailer has repositioned itself to memorabilia and collectibles along with more offers in order to boost sales. 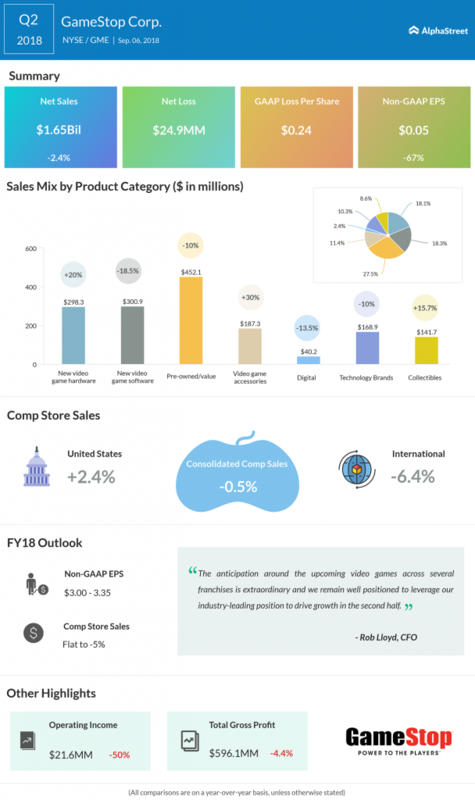 Last quarter, gaming hardware and accessories were the saving grace of GameStop in sales. But given how the retailer is pushing to find new ways to get back its customer base, we’ll be on the lookout for new strategies and specific improvement in sales metrics as it posts results on Thursday. Follow our Google News edition to get the latest stock market, earnings and financial news at your fingertips.